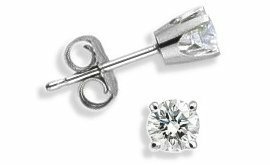 Enjoy the finer things in life when you select these glorious baby diamond stud earrings. Highly polished 4-pronged white gold post and push-back settings cradle these brilliant 0.20 TCW round diamonds. Each diamond is hand selected and hand set for perfect display.